During the BaselWorld 2011 exhibition, Grönefeld Exclusive Timepieces will reveal the One Hertz time piece. 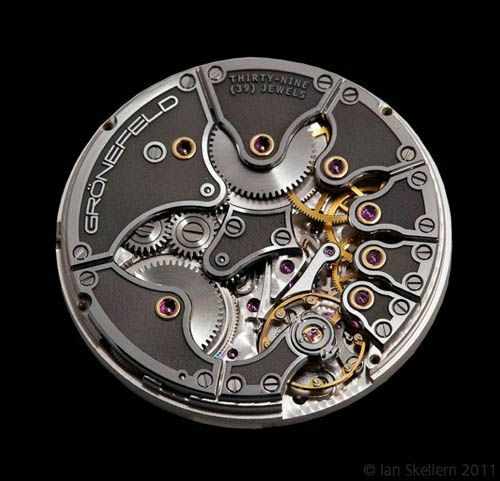 The One Hertz features a completely original in-house movement (pictured below) developed by us and features an independent deadbeat seconds mechanism plus an innovative push-to-set/push-to-wind” function. The One Hertz is unique among wristwatches in that its deadbeat seconds are powered by a secondary gear train that is independent of the gear train powering the hour and minute indications. The architecture of the movement unconventional and distinctive, and the extreme level of fine finishing adds future value and value for watch aficionados. If you’re interested to see the One Hertz and talk to Tim and Bart Grönefeld, please do not hesitate to make an appointment for BaselWorld at Hall 5.1 booth C.01. If you are unable to visit BaselWorld this year, make sure to keep an eye on the official Grönefeld websites at www.gronefeld.nl and http://www.facebook.com/GronefeldTimepieces. During or shortly after BaselWorld, I will post some pictures of this long awaited deadbeat timepiece with Dutch roots. Photo credits go to Ian Skellern.